Recently, I had the opportunity to participate in a group training with Mammut Snow Safety technical rep Doug Workman where we spent a morning practicing some of the advanced functions of the Pulse Barryvox transceiver. Generally, this beacon (as well as the new Barryvox S which replaced the Pulse in 2017) allows either single or multiple burial searches to be accomplished extremely quickly and easily. However, when a searcher confronted with interference that prevents the marking function from working normally or a close proximity multiple burial which frequently involves signal overlap, as with any digital beacon things fall apart--when overlapping signals or interference is present, all digital beacons struggle to differentiate the signals. In such instances, as with any digital beacon, searchers need to recognize what is going on and revert to an alternate search strategy (i.e. micro strips, micro box or 3-circle) to conduct the search. All digital beacons struggle in these scenarios, the difficulty is to recognize what is happening and definitively knowing WHEN to revert to an alternate search strategy, versus when you can continue relying on the marking function. One of the most fundamental things I took away from the session was the importance of the "mental map" that a searcher can use during a multiple burial search by integrating analog information into a typical digital search. By "mental map", I mean that as you progress through a search, you can quickly and easily form a mental picture of not only how many burials you are dealing with but also where each of them is relative to each other. Why is this important? Because this "mental map" allows a searcher to see and react to signal overlap problems AS THEY HAPPEN, rather than realizing what's going on after a problem occurs. In this post, I want to go over the user settings that will allow you to take advantage of this function, and explain how to do an "ANALOG TONE CHECK" during a search, which allows the searcher to make a factual mental map of the burial scenario, and use it as a tool to recognize digital MISinformation due to signal overlap or interference, in real time. We've edited this post to apply to both the Pulse and the Barryvox S.
The preferred settings for advanced Pulse and Barryvox S users (SAR Teams, Ski Patrols, Guides and all other users who will practice micro-strips or another alternate search strategy) allow the rescuer to listen to ANALOG TONES 100% of the time. Digital distance and direction will simultaneously be displayed on the screen--this is a seamless integration of both digital display with analog tones. Pulse Settings: Consult the Pulse Barryvox manuals for information on how to access the Start Menu. The Pulse Reference Manual is AT THIS LINK. Barryvox S settings: Instructions on navigating to the settings are at the Barryvox S extended reference guide, here (link). Once you have your beacon configured this way, you never need to change this setting again--set it and forget it. This setting allows you to use the distance and direction arrows you are accustomed to in a standard digital beacon search, but they simultaneously give you RAW ANALOG TONES throughout the entire search--there is no need to switch back and forth between a standard digital beacon search and an analog search, it is a seamless combination of the two. This is important because only the true analog tones can give you an accurate representation of what is really going on if there is a signal overlap problem, and this is what you will use to make your mental map. Believe it or not, when things get difficult your brain is better at recognizing the analog tones than the beacons' digital processor is. Again, once you have the user settings configured this way, you will not go back and change them during a search--leave them on for all searches. If you're a geezer like some of us you may remember your old analog beacon, and how you had to progressively turn the sensitivity down as you got nearer to a burial. In effect you were reducing the range of your transceiver as you got closer during the bracketing search, in order to make it easier to hear when you were moving closer or moving farther away from the transmitting beacon. A modern beacon is still doing this, it simply does it for you automatically. We're going to take advantage of this principle in our tone check. You are practicing a beacon search, moving down an imaginary slide path in the "Signal Search". Your beacon chirps to alert you it has picked up a signal. Looking down, you see that the display shows 2 icons representing different transmitting beacons, the closer of which is 40m away. As you conduct the coarse search, you approach to 10 on the display of the searching transceiver and pause to listen for a few seconds. Your searching transceiver has turned it's own sensitivity down for you as you approached. If you still hear the analog tone from 2 beacons, this tells you that both beacons are within the reduced range which is no more than 50% larger than the distance indication, i.e. they are somewhere inside approximately a 15 meter radius. Now, you approach to 3 on your display, the range at which the beacon will transition into the fine search. Your beacon has turned its sensitivity down again, so we pause again for a few seconds to do another tone-check. Do you still hear 2 signals, or only one? What does this tell you? If you still hear two signals, that means that both transmitting beacons are still within a short radius (no more than 50% larger than the distance indication, so about 4.5m max. ), the approximate reduced receiving range of your searching transceiver. If you only hear one signal, it means the other transmitting beacon is now out of range, and there is only one transmitting beacon in your immediate vicinity. This is the "mental map". It can be applied to a search with any number of beacons. It only takes a few seconds to do this, so now we'll look at what it can do for you. Lets look at a common scenario to illustrate how to use the "mental map". 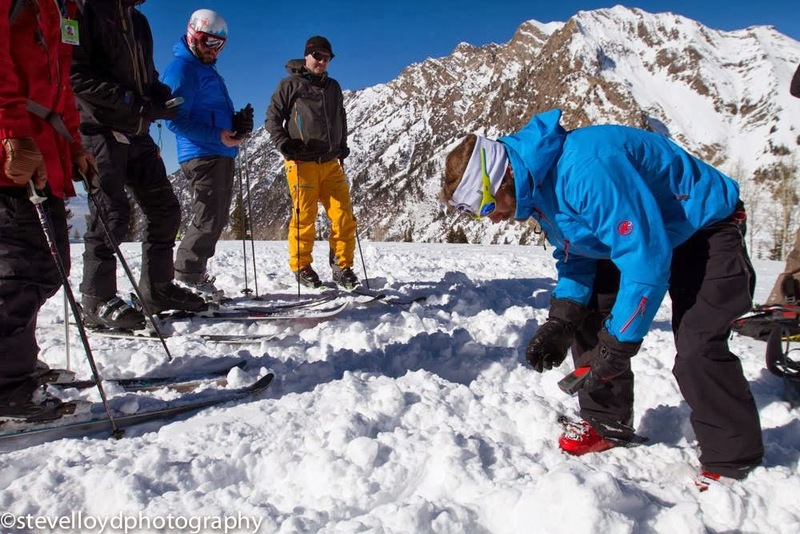 A similar scenario happens frequently in training (a three-burial search involving two beacons close together and one farther away), so while it represents a rare "worst case" scenario for a skier or rider it is commonly practiced to ensure that guides and advanced recreational users traveling in a group know how to deal with a complicated search. The scenario: You are skiing with a group of friends. Skiing one at a time, skiers leave a safe spot on a ridge and ski over a roll to an island of trees that's out of sight. The third skier loses control and skis to the side of the tracks and falls, triggering a wide slab that carries him over the roll and out of sight. You organize the group to conduct a beacon search. As you are moving down the slide path and over the roll, you see that the slide moved through the island of trees where the first two skiers had stopped, and deposited debris beginning just below the trees and into a tight terrain trap below. Your beacon chirps to alert you that it's picked up a signal when you approach the island of trees. Your beacon shows three buried subjects. As you approach to within 10m of the first, you stop and do a quick tone check. You hear a chaos of beeps--more than two signals. As you continue to within 3m of the signal, your second tone check indicates only 2 signals. You do a fine search, and get a solid probe strike 1 meter deep. The rest of your group begins to excavate, while you push the "mark" button on your transceiver and continue to search for a second skier. Here's the catch: When you mark the first buried subject, your beacon's display points 16m down the hill and into the drainage (or gives you a "signal search" zig-zag arrow)--but your 3m tone-check indicated 2 buried subjects within close range. Your DIGITAL display does not match the ANALOG information, i.e. your "mental map" has just told you that you have a signal overlap problem, in this case a "ghosting" beacon! When the signals from 2 beacons in close proximity overlap, it fools digital beacons into thinking there is only one nearby beacon--even "multiple burial indicators" often fail in this scenario since they also rely on the digital signal separation and hence are susceptible to overlap--but by comparing your mental map to the digital display info, you already knew you had two nearby signals, so when the overlap happened you knew exactly what the problem was and you can now act on it appropriately without getting steered off-course by the failure of the digital signal separation. Now, you can immediately choose an alternate search strategy: Switch to "analog" on a Pulse or "Alternate" mode on a Barryvox S--this is your "alternate search mode", and configures the beacon to best perform an alternate search method--and you conduct a micro-box search to find the buried subject that you know is quite close, and you avoid leaving the close burial un-found and spending valuable time picking your way down the slope to look for what is likely a deeper burial in the terrain trap. If there had NOT been a signal overlap problem, the marking function of your beacon would have worked fine, as it usually does. In this case you could have continued to rely on the marking function despite knowing there was a close-proximity multiple burial. That is one key benefit of using this technique to identify when the digital display doesn't match the analog tone, is that more often than not they WILL match--this allows you to continue using the marking function of your beacon with confidence when other beacons will be forced to resort to micro strips as soon as they identify a close-proximity burial (IF they can recognize it!). Had you not had the benefit of the analog tones to conduct the tone checks, it would have been a lot more difficult to recognize what was happening and act on it nearly as quickly. Lets face it, all the stars would have to misalign for this scenario to become important, but since there's no downside to having the capability and practicing it, the one time it does become useful it'll be awfully important! Especially in areas with a lot of RF noise as is often encountered in and around ski resorts or when searching for older analog-only or 2-antenna digital beacons in combination with any other beacons, the overlap and interference issues described here happen pretty frequently with close-proximity burials, and the incidence of ghosting beacons seen during beacon practice sessions is proof of this. (this is why many professionals recommend replacing analog-only or 2-antenna digital beacons with a modern 3-antenna beacon--because older 2-antenna digital and analog-only beacons make signal overlap issues more likely and hence make any search with a digital beacon more difficult. This means if you are still using a Barryvox Opto-3000 or a Tracker 1 or any analog-only beacon it's time to replace it). Remember: The goal here is to AVOID having to use an alternate search strategy if at all possible, even if you identify a close-proximity multiple burial. As long as the info you get from the analog tones matches the digital display info, keep using the digital marking function, it's faster! On a Pulse, switch to analog-only by pressing both side buttons simultaneously for 3 seconds. You are now in analog-only mode. On a Barryvox S, switch to "Alternate mode" by scrolling up to the magnifying glass icon and pushing the orange flag button to confirm. This places the beacon in the optimal configuration for conducting an alternate search, either Micro Box or Micro Strips. It is necessary to go into this mode to perform an alternate search. Here is a (You Tube video (link)) demonstrating the Micro Search Strips and Micro Search Box. Generally speaking, the Micro Search Strips are used when 2 or more analog tones are heard at the 10m Tone Check. The Micro Search Box is a great tool all Pulse and Barryvox S advanced users should practice, and is used when 2 or more tones are heard at the 3m Tone Check--think of it as being similar to the 3-circle method, but with only 1 circle utilizing the analog tones to define how large to make it, and squaring it off to aid in maintaining coupling orientation. This blog post (link) goes into more detail on the Micro Search Strips and Micro Search Box. For now, practice your tone checks. Incorporate them into all of your practice searches and start developing your mental maps. You will be amazed at how little time and effort it takes, and how much this actually simplifies and clarifies complicated multiple burial scenarios. tones: Analog doesnt appear (any more?) as a setting on my (4.0) Pulse. Maybe update this post to avoid confusion? If your beacon is set to the Basic user profile you will not see some of these menu options, including analog tones. If your beacon is set to the advanced user-profile and Tones: analog is not an option, then the likely cause is that the menu option was disabled during the firmware update. I'm not certain I understand the situation, so if this doesn't answer the question for you drop me an email at davef "at" mammutusa.com and I can try to troubleshoot with you. And, if it helps, you'll need to be in the advanced user-profile, and inside the SETTINGS menu you will find "tones" with an option for analog.